Cleanrooms are necessary in many industries to control the level of contamination in the air by filtering it to exclude dust, airborne microbes, aerosol particles, chemical vapors and other low level pollutants that are harmful to sensitive equipment. Using highly specialized return air chase systems, the air quality, humidity and temperature inside these rooms can be carefully regulated. The International Standards Organization (ISO) has stringent classifications and requirements that to even the most knowledgable industry workers, can be quite confusing and overwhelming. There are a great deal of specifications to be considered when planning your cleanroom, and the highly skilled staff at Panel Built is ready to walk you through the process. 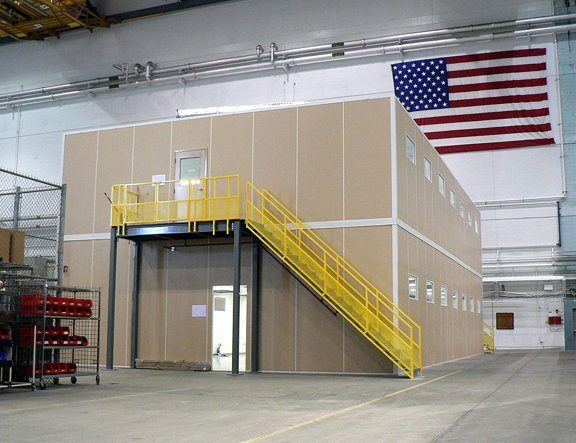 Panel Built specializes is modular cleanrooms. 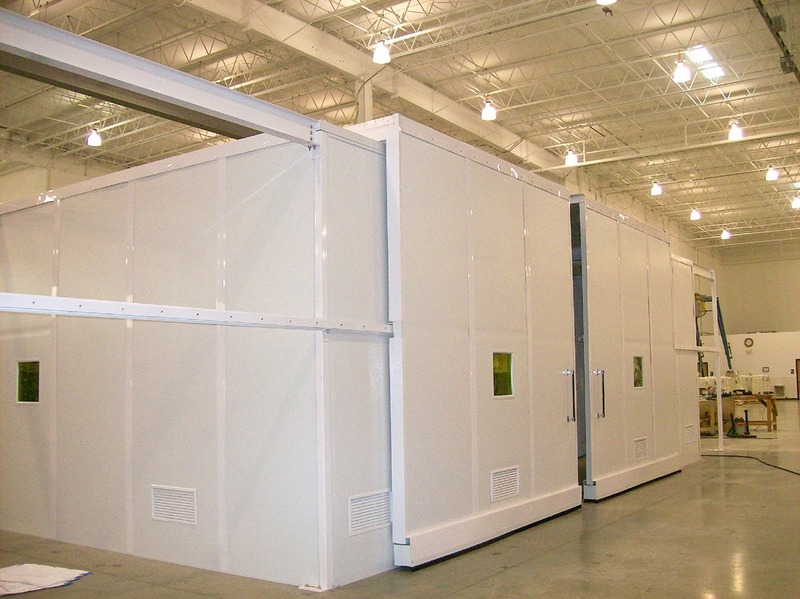 Because of their flexible design, easy installation and durability, a modular cleanroom is the ideal choice for your facility. A modular design allows for easy expansion and portability. If you need to enlarge your cleanroom as your company grows, our versatile units allow your original layout to expand, without the need to rebuild a new room from the ground up. If you transfer your company to a new facility, your Panel Built modular unit can be easily disassembled to move with you. Prefabricated modular cleanrooms also save you money, costing significantly less than traditionally constructed hard wall rooms. The ISO demands that all cleanrooms meet strict regulations and classifications. Panel Built’s panels, doors and windows for our units already meet your Federal Standard Class needs, including the Class 10,000 cleanroom. We make it easy for you to have a complete cleanroom using our flexible wall systems along with the necessary components that meet all ISO mandates, as well as perfectly suit your company’s needs. We provide you with cleanrooms that include a hidden return air chase systems that carefully regulate the room’s airflow. By using the wall cavity itself along with appropriately sized return louvers, your room will maintain the specifications required for cleanliness, temperature, humidity and air pressure, allowing the air to only travel out, and preventing any dirty air from entering the chamber. This process also saves you money by eliminating ductwork and chase walls often needed when constructing hard wall systems. Every cleanroom in a facility is assigned a classification in accordance with the degree of cleanliness required of the specific manufacturing steps. Panel built provides you with units that meet both the ISO 6 cleanroom, and the more frequently used ISO 7 cleanroom. Our cleanroom experts always consider your needs regarding the design of your room so it perfectly controls the air-change rate. The design of your cleanroom is critical, and in order to ensure your chamber meets all ISO requirements, as well as to make your room as comfortable for your employees as possible, we work very closely with all our suppliers. Because a functional and effective cleanroom requires components such as sealed and gasketed light fixtures, dropped ceilings, recessed lighting, covered light switches and HEPA fan filters, we make sure they are available to install when your unit is being built. We also guarantee our unbeaten delivery times. Our staff will happily supply your room with as much as you need. We also know your room requires a HVAC system, and we will specify, supply and put that in for you too. But if you already have a mechanical contractor on staff, we will gladly provide him with all the necessary information he will need to appropriately design and supply that system himself. We completely understand that obtaining a cleanroom can be a complex endeavor, and respect that you may not have the resources available to guide you on such a big project. We want to take that worry away from you. We realize you have a business to run. As our valued client, we want you to keep your focus on what you do best, and allow us to do what we do best. We promise you that as a Panel Built customer, we will provide you with a cleanroom that will meet all your needs, and we will always treat you with the kindness and respect you expect, and deserve.